The Gullo Student Center and the South Campus Gym both feature all four panel profiles from Morin’s Matrix Series. 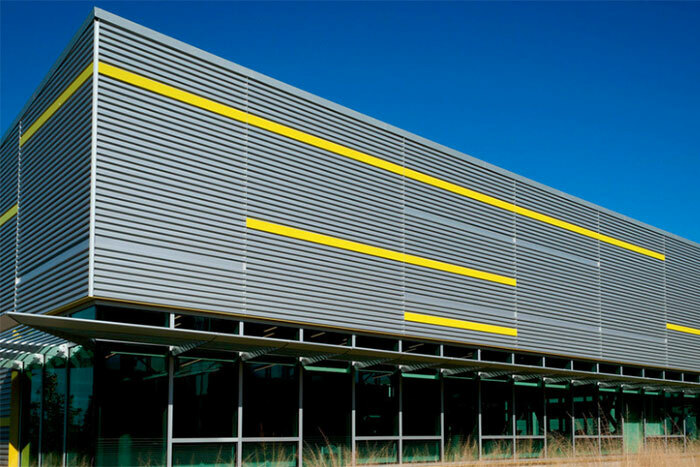 The aluminum panels are installed horizontally and vary in colors like Evergreen and bright silver. With the rapid growth of Evergreen Valley College in San Jose, California, the students needed larger and more modern gathering places. The previous Center for Student life was made from concrete, bleak and lacked natural light. Nothing existed where the new gym is but now you can see it is bustling with students exercising. The silver panels above the glass windows invite students in to pick up some weights. The new Gullo Center for Student Life was completed in 2015. It is located at the heart of the campus amidst towering Evergreen trees that match the Evergreen panels. The large windows framed by the metal panels seem to make the building flow into the natural landscape behind it. Now the Center for Student Life is a creative hub on campus that attracts students to gather, meet, and work.